My Scotty has been sick a few times over the last couple of days. There has been no change in his food, but he has recently been less interested in it. We presumed this was from the heat. We've had him for about three months since getting him from a Rescue Center. I was wondering if there would be anything wrong with him, as he has been eating what he throws up! What should I do? It's hard to determine why your dog is throwing up without having him examined by a vet. He could just be suffering from the heat, or he might have eaten something he shouldn't have. Is your dog acting lethargic? How soon is he throwing up after a meal? Do you notice your dog filling up on water after he's eaten his kibble? This will bloat the food, and sometimes dogs will throw it back up to relieve the pressure on their stomachs. Are there any accompanying symptoms such as diarrhea? Has your dog ever been wormed? My immediate suggestion is to take up his food for about twelve hours to give his system time to clear the track, so to speak. I would still leave the water bowl down for him, but no other biscuits or leftovers. Unless you see him acting abnormally, or otherwise going downhill, you can probably give him one more day to see if he gets over the upset. However, if you answered yes to my questions about lethargy and diarrhea, I would go ahead and schedule an appointment. Hope this has given you some direction, and let us know how he's doing. I took your advice on taking away food for twelve hours, and he does seem slightly better. He was fully interested in his food, which had also been a small concern. I'm sure that his improvement will have also been helped along by the long heat spell ending. I'm glad to say he hasn't been sick and seems almost fully recovered! Hi Kelly, Why do dogs eat what they regurgitate? The real question here is what won't a dog eat? Dogs will eat virtually anything they can get their mouths around. This includes items we humans consider food and a lot other things we wouldn't touch with a ten foot pole, including feces, road kill, and yes... vomit. The urge to eat vomit may actually harken back to wild dog behavior. A wild mother dog will feed on her kill, then go back to the den and regurgitate the partially digested meal for her pups. This survival instinct probably still lurks somewhere in the domesticated canine brain as well. Many times, there is partially digested food in a dog's regurgitation and it seems perfectly natural to him/her to reclaim it. A bit of canine "waste not, want not". So, what can you do about it? Try to watch what your dog eats to determine if a certain food source causes the vomiting and eliminate it from your dog's diet. Cleaning up the vomit immediately also keeps your dog from having the chance to eat it, but you have to be really fast. It's a race I've lost on more than one occasion with my own dogs. Hope this has given you some insight. Hi, and thanks for your time. I have a two-year-old Shepherd/Rottweiler mix, and he is very special to me. I am writing with concerns about his stomach. The sounds that are coming from it are terrible, lots of loud gurgling. Two days ago he stole about three-quarters of a strawberry pie off the counter and ate it. Would this cause his discomfort and what should I do for him? The rumbling in his tummy is terrible and he hasn't eaten anything but grass. Strawberries are highly acidic and while they won't harm a dog if it eats one, three-quarters of a pie is way too much for any stomach. My concerns for your dog are about more than eating the pie. German Shepherds are one of a number of dog breeds that are subject to a serious malady known as Gastric Torsion, in which the stomach twists around, closing off all entrances and exits. Gas and stomach acids are then trapped and the stomach begins to bloat painfully. This condition can be fatal if left untreated. I urgently recommend that you take your dog to your vet. He/She can give your dog medicine for his indigestion and diagnose any larger problems that may be going on. It's the only way to be absolutely sure. Best wishes for your pet's full recovery. I have an eight-month-old Terrier puppy that I brought home last Monday. She has not been eating, and I have tried her with a lot of different dry and canned dog foods. She has been sick, and there are long worms in her vomit that look like pasta. I have ordered Drontal Plus to try to kill the worms. Do you think this will work, or is there something really wrong with her? Sounds like your puppy has an advanced round worm infestation. Her current condition sounds awfully bad, and I wouldn't wait for medication to arrive in the mail. I recommend an immediate trip to the vet before she goes further downhill. I also think you should inform whoever you got your puppy from about this situation. 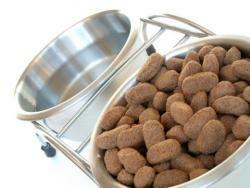 If one dog on the premises had round worms, chances are many others do too, and all will need to be treated.